A popular new feature added to the Windows taskbar is the Jump list. This allows users to do things relating the selected program: open recently used files, or close the application, all from a right click on the shortcut or icon. For example, you can right click on Internet Explorer you can choose from open tabs or close IE. With Outlook 2010, you can choose New items, or close Outlook. The jump list makes it easy to create appointments or new messages while working with other applications - you don't need to bring Outlook into focus (or open it, if closed) to create a new item. 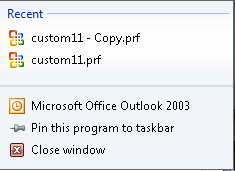 If you have Outlook pinned to the taskbar or start menu, the jump list is active even when Outlook is closed. You'll need Outlook open if you want the message to leave the Outbox, but can use the jump list to create new items while Outlook is closed. You can use this trick to open the Jump list with a left click: Click on the taskbar button while you hold the left mouse button and drag towards the center of the screen. The jump list will come up as you move the mouse. Drag the cursor upward if you have the taskbar in the default location on the bottom of the screen, but if you're like me and have that taskbar on the right, swipe the cursor to the left. I've had a few questions in recent weeks asking why the jump list in Outlook displayed the list of recently opened files and not the New item list. The jump list is supported by Outlook 2010 only. If you install an older version of Outlook on Windows 7, you'll get a list of recently used files, such as templates (which isn't necessarily bad and heavy users of template might like it with Outlook 2010 too).